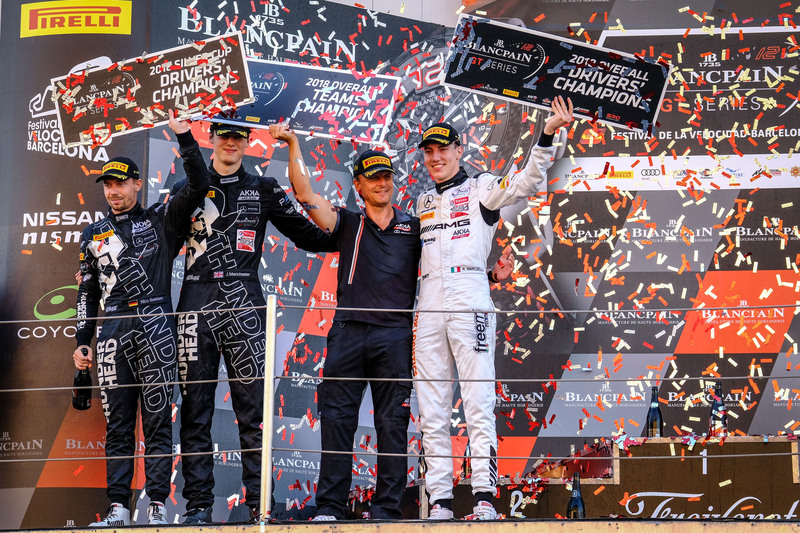 This final round of the 2018 Blancpain GT Series allowed Team AKKA-ASP to be crowned as the Team Champions, while Raffaele Marciello took the drivers’ title, two weeks after winning the Sprint Cup title alongside Michael Meadows. The Italian driver also finished as vice-champion in the Endurance Cup, as did AKKA-ASP in the Team classification. After winning the Sprint Silver Cup, Nico Bastian and Jack Manchester also secured the overall title in the Silver Cup (Sprint + Endurance) with another podium in the race. As for the duo of Eric Debard and Fabien Barthez, after taking a podium finish in the AM Cup (3rd in the race), they finished third overall in the Endurance AM Cup. In the final round of the season, the drivers of the #88 Mercedes-AMG did everything they could to claim the third title. Despite everything, Raffaele Marciello, Daniel Juncadella and Tristan Vautier finished second in the race after two consecutive wins in Catalonia in 2016 and 2017. A fine harvest of successes, to the delight of Jérôme Policand. Traditionally, the final race of the season takes place in the warm Spanish sunshine, and more precisely in Catalonia. 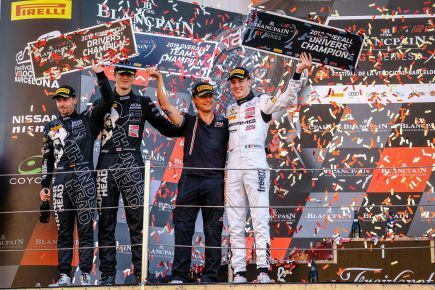 Once again, this year saw the circuit of Barcelona host the final round of the Blancpain GT Series with a top-level event and an exceptional grid of no fewer than 52 cars. Two weeks after the crew of Raffaele Marciello and Michael Meadows won the Blancpain GT Series Sprint Cup and the pair of Nico Bastian and Jack Manchester were victorious in the Blancpain GT Series Sprint Cup Silver Cup, Team AKKA-ASP was in a good position to continue in the same way in Spain. Up against the French team, however, the competition was fierce in both the team and drivers’ competitions. During qualifying, everyone was concentrated on their own aims. The first session, disrupted by a red flag, resulted in a patchy session where no-one could fully express themselves. The second, with yellow flags, a full course yellow and a finish under red flags, was no better. Not easy to set the best time with just one flying lap, to Daniel Juncadella’s bitter experience. In the third session, there was finally a flurry of lap time improvements. Behind the wheel of the #88, Raffaele Marciello set the fastest lap for a GT3 car in the Blancpain GT Series in Barcelona, with a time of 1.43.667. However, this effort still placed the car 6th overall after taking the average of the three sessions. Starting from the third row, it was clear that the task of claiming the win and the title would be more complex. There was the same disappointment for the #90, starting from the 10th row, and for the #87 (Jean-Luc Beaubelique, Mauro Ricci and Nico Jamin) on the 19th. However, there was great satisfaction for the #89 which claimed a magnificent pole position in AM. Fabien Barthez and Eric Debard do not do things by half. Last but not least, the #35 SMP Racing by AKKA-ASP car of Denis Bulatov, Alexey Korneev and Michael Meadows, claimed a ninth-row start. Raffaele Marciello did the first stint. He made a good start and gained a position on the second lap. Nico Bastian and Fabien Barthez were already leading the Silver Cup and the AM category, while Nico Jamin had already gained nine positions! At the front and in the pack, the pace was frantic.